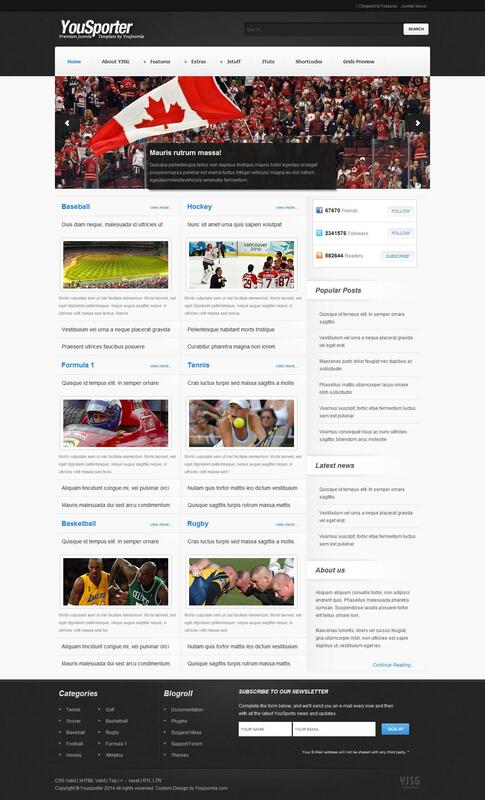 YJ Yousporter - fresh template from a professional design studio YouJoomla, to create an online store or a news site on the sports theme. Gorgeous design template designed to the smallest detail, there are several color schemes that are easily configured through the control panel template. The structure of the archive includes extensions like: YJ Image Slider 3.0, YJ Accordion Newsflash and YJ Newsflash Ultimate. This template has 51 module positions, 4 types of menus, CSS styles and original built-in RTL support. For faster page loading speed compression is used on the server side. YJ Yousporter perfectly optimized, supports a variety of mobile platforms and modern browsers.